Hello, Doctor Doom! I recently watched the terrible, much maligned Fantastic Four movie from last year. Yes, it is indeed quite a stinker. One of the worst things about the movie is Dr. Doom. It is hard to explain to somebody who does not read comic books why seeing this movie version of Dr. Doom is so sad. Dr. Doom in the comics is the ultimate villain. He is much feared and always spoken in hushed tones from every character, even heroes as important as Captain America. He is hyper-competent and always has a plan within a plan. 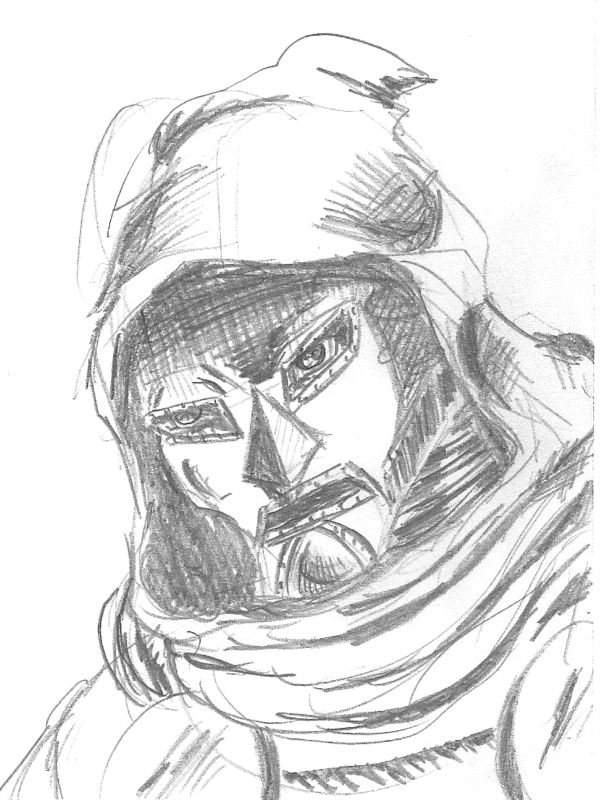 However, in every movie version of Dr. Doom, he is generically evil and usually is given powers for some reason. On to the picture itself, I always feel that Dr. Doom looks more regal and intimidating when he is wrapped in a big cape and a big hood that looks like it practically engulfs his face in shadows. I personally also like that his hood is so baggy, that it almost looks like a scarf. There is something about it that looks appealing to me.